Typically in Michigan, we don’t worry about dought issues until July. Wherever you live, I think you would agree that weather hasn’t been very typical this year. I was visiting with my cousin who lives in northern Florida, and she planted her tomatoes which were soon drowned in their floods. 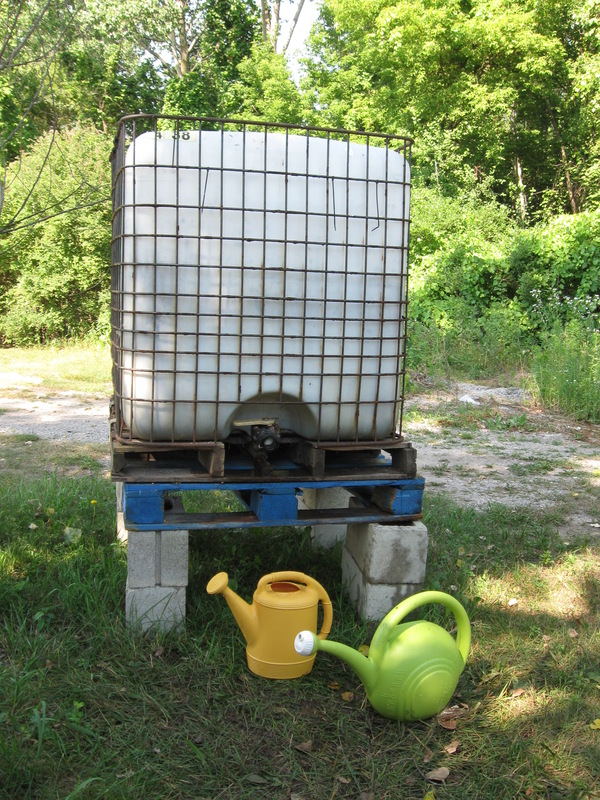 It’s been tough at the community garden that I belong to hauling water back and forth from the water source to my plot. At least we have a water source. 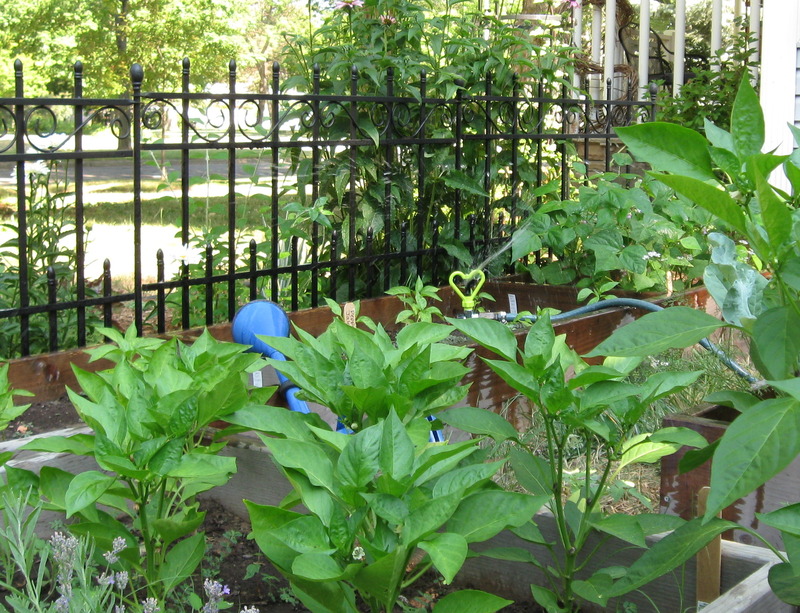 Other community gardens rely on rain, or connect many sections of hose together to get water from a donor’s home or apartment. This year at My Urban Farmscape, I’m using a Rainforest Ecological sprinkler. I love how I can adjust the spray to reach as little as 6 feet up to the full 15 feet width of my garden. In this picture you can just see the green heart-shape which helps to break up water droplets. It’s time for me to raise this spike sprinkler or switch to the tripod sprinkler. 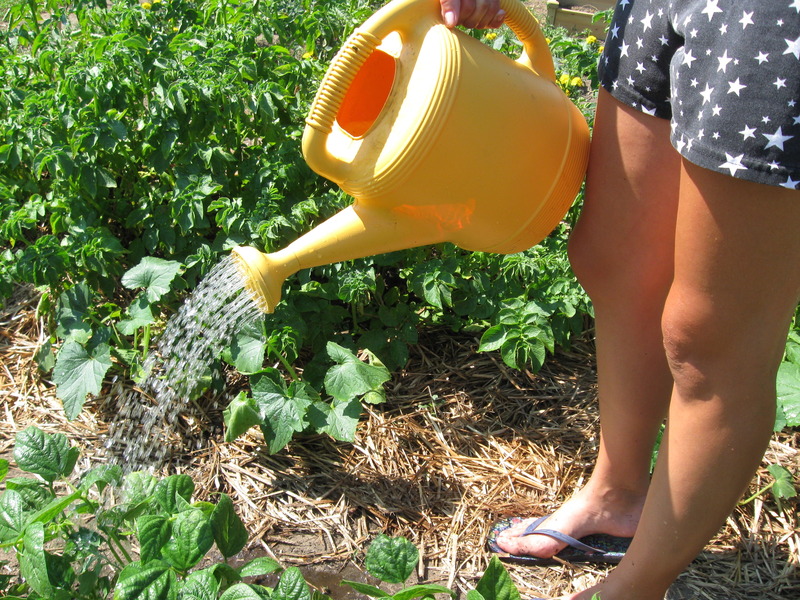 Now that plants are maturing in the garden it’s important to remember to water deeply. This will encourage roots to reach deeper and make for a stronger plant. So water longer and less often. Mostly, watch your plant. It’s okay if it starts to wilt a little. Look at all the plants around that are thriving in this crazy summer weather. Plants are tough and they do a good job taking care of themselves. 6 ft Tripod Sprinkler If you have a little more room in the garden, use this. It is collapsable and easy to store and the best part is that you can adjust the clips on the legs if you have uneven ground. At 6 ft off the ground, you can really water a larger space if you have it. Patti, can you add a link to the Rainforest Ecological Sprinkler, and maybe some details about how ecological it is? Thanks! Hi Elizabeth. The biggest ecological benefit would be that it uses less water than other sprinklers. I have added a link to their website at the end of this post which has some great videos along with links to purchase on Amazon if you don’t have a retailer near you. Thanks for your question!